Your ability to enjoy the tabletop game Secret Hitler will likely depend on your ability to laugh as an increasingly impotent progressive coalition fails to halt the rise of fascism. No but seriously, it’s a fun party game. Secret Hitler is brought to us by a number of designers including Cards Against Humanity’s Max Temkin. It’s a party game for five to ten people, one of a rising number of tabletop games built around plotting, deception, and manipulation. It borrows heavily from Don Eskridge’s terrific The Resistance, as well as other “You think I’m this but I’m actually this” games like Battlestar Galactica and Mafia. I played a few games with some friends over the weekend and we had a very good, shouty time. Before the game, players are dealt face-down cards that divide them into two teams, Fascists and Liberals. One Fascist player is Hitler. The non-Hitler Fascists are allowed to covertly identify the other Fascists as well as Hitler, so they have all the information. The Liberals outnumber the Fascists, but at the start of the game they don’t know who’s who. Hitler also doesn’t know who’s a Fascist or who’s a Liberal, so he or she wants to identify the other Fascists without tipping anyone off. Each round centers around two players in two government roles: The President and the Chancellor. The President title moves around the table each round. The current President player nominates a Chancellor, then everyone votes. The President’s nominee only becomes Chancellor if they’re voted in by a majority. After that, the Chancellor is in office for the round and can pass a policy chosen from two policy cards given to him or her by the President. The Fascists want to pass a certain number of Fascist policies and/or elect Hitler chancellor, after which it’s game over. The Liberals want to pass a certain number of Liberal policies and/or assassinate Hitler, which also ends the game. The policies themselves are just tokens to be counted, but if you pass a certain number of Fascist policies, the government will get special powers. Pass two Fascist policies and the President can look at any player’s party affiliation. Pass four, and the President can assassinate someone, removing them from the game. In order to win by electing Hitler, the Fascists must have already passed three Fascist policies. Here’s an example. It’s John’s turn to be President. He nominates Susan to be Chancellor. Everyone’s pretty sure that John is a Liberal, but no one’s quite sure about Susan. She might be a Fascist. After some discussion, enough people vote “Yes” on Susan that she becomes Chancellor. John then draws three policy cards, discards one without showing it to anyone, then hands the two remaining cards to Susan face-down. Susan passes a Fascist policy, which moves the Fascists one step closer to winning. With that done, everyone starts talking. Why did Susan pass a Fascist policy? She claims John gave her two Fascist cards, so she had no choice. John claims he gave her one Fascist card and one Liberal card, so one of them is lying. Or maybe they’re both secret Fascists, and they’re trying to sow confusion? It’s time for another round, and everyone probably feels like they know less than they already did. The friends we played with over the weekend had taken it upon themselves to print out and build their own custom version of Secret Hitler, using a variant that I’m sure will become popular among a subset of the American population over the months to come: Secret Trump. The teams were now Fascists and Progressives, the policies Progressive or Conservative, and the two government offices the Speaker of the House and the President. Instead of Hitler, the game-ending leader is Trump. 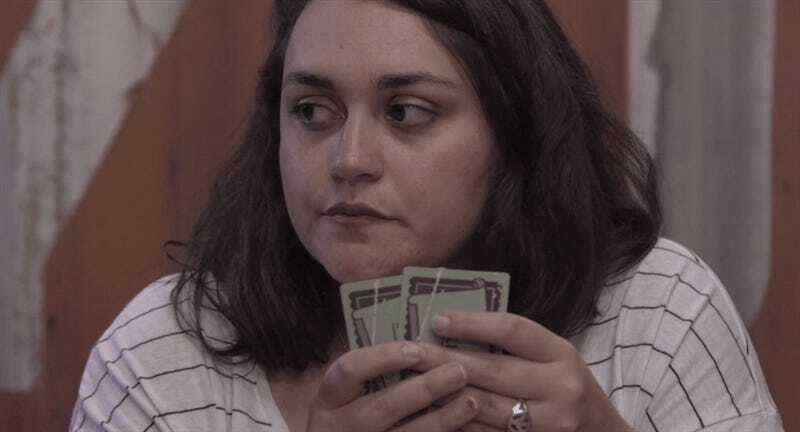 Secret Hitler’s mechanics often reflect real-world situations to an impressive degree, which elevates it beyond a more straightforward game of deception. Liberals can advance fascist policies to give themselves more power when they’re in office, but they risk leaving that power in place for when Fascists take over. It’s very easy for the Fascists to exploit the Liberal team’s built-in lack of unity and to deliberately misconstrue what happened a few rounds ago. Wait, who voted for Susan in round three? When did John say he might vote that way? Hang on, I never said that! If you’re accusing me, that makes YOU the fascist! During one game several of our Liberal players degenerated into finger-pointing and mistrust to the point that we started arguing over who was being the bigger BernieBro, all while the fascists happily plotted their ascension. You get the idea. The parallels are enough to be exhausting, particularly if you don’t find what’s currently happening in Washington to be all that funny. If you’d rather laugh than cry, however, Secret Hitler is a solid way to kill an evening with your friends while awaiting the end times. Be sure to bring booze.